Last Monday I was in tears feeling like ME has taken away so much from me and made my life so small. Then two things happened during the week that turned this around and gave me much joy. On Tuesday I received an email from Waltons Garden Buildings, letting me know they had reviewed my blog and had included it in their 18 Fabulous flower blogs blogpost. 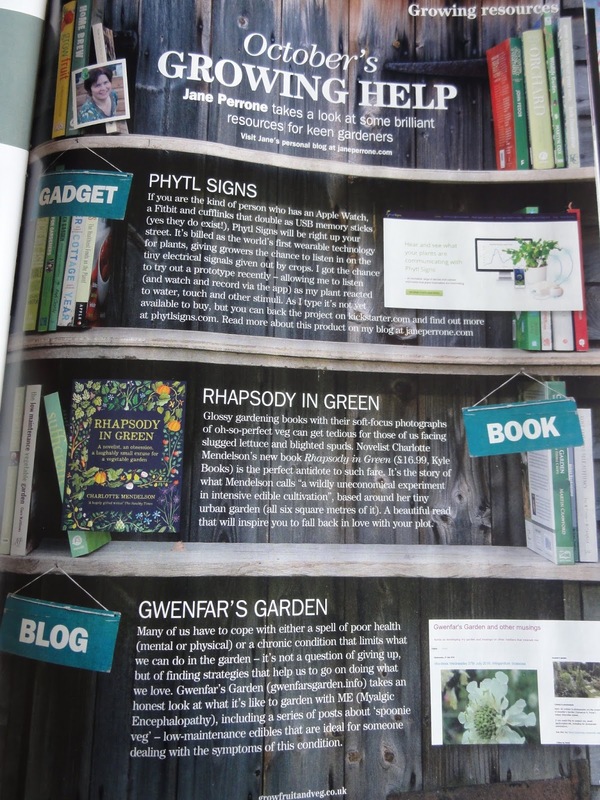 This was a wonderful surprise, particularly as I was included alongside garden bloggers I love such as Helen Johnstone, The Patient Gardener, Helen Gazeley Weeding the Web, and Jane Perrone, gardener, garden writer and author of The Allotment Keeper's Handbook. Then on Friday I got a copy of the October issue of Grow Your Own magazine and found Jane Perrone had included my blog in her 'October's Growing Help' column. I also particularly liked that both pieces spoke about gardening within the context of having a chronic illness, showing a wider audience that it is possible to garden, if somewhat slowly, when you are long-term ill.
After feeling like I had so little connection to the world on Monday, by Friday I realised that in a small but very important way, this blog helps me reach and interact with people I might not ever meet, but whom I can share the ups and downs of the wonderful world of gardening and horticulture. 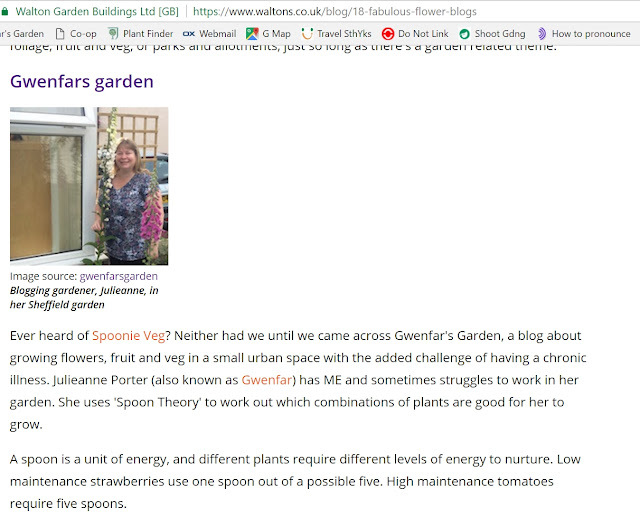 I find your blog a fascinating insight into how you manage to garden with ME and I'm so pleased it got this public recognition. It's well deserved. Well done, it's good to know that you are reaching a wider audience, I can imagine how thrilled you must have been. Hurray! Isn't it odd how things like this can happen just when you need them most? That's fantastic! Yes, it's really difficult to 1) keep putting your inspiration, hard work and creativity out there when you don't know if people are responding and 2) continue regular posts when dealing with chronic illness. I salute you! Well done and keep up the good work.